A classic watch should be a staple item in every mans collection. A Rolex is one of the most prestigious watches you can buy. The demand for them is high and the resale value is very good. If properly cared for, an investment in a Rolex can increase about 20-30% over a 5 year period. Here is a breakdown of the 6 most popular – and desirable Rolexes you should add to your list of goals. Check out this Rolex for sale, the Submariner will always be a popular choice among collectors for its classic and timeless style. 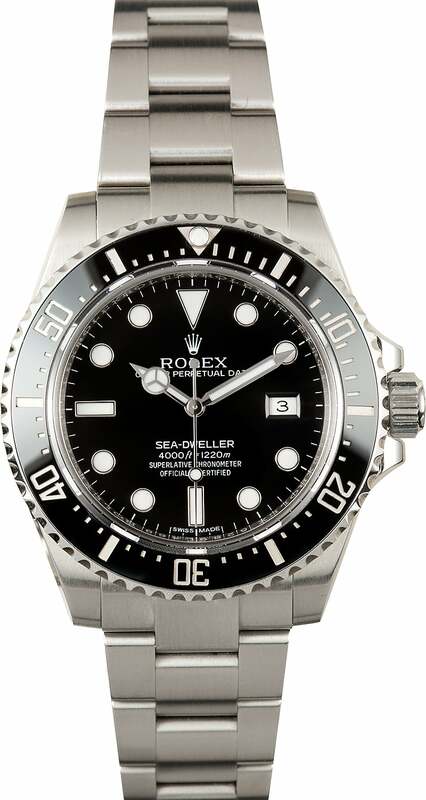 In recent years, the brand has made several impressive upgrades to the Rolex Submariner line, including the addition of a Cerachrom bezel with a ceramic insert, a maxi dial with a larger luminous display, the use of the brand’s parented Oystersteel, and a new case and bracelet design. One of the most sought-after variations of the modern diver is the ref. 116610, which honors the style of the original model from the 1950’s while bringing its own contemporary upgrades to the table. One of the hottest Rolex watches on the market today is easily the Daytona ref. 116500. While stainless steel variations of the brand’s racing watch have always been in high demand, this 6-digit variation takes the cake, offering an Oystersteel finish in Rolex’s proprietary 904L steel, Chromalight lume on the dial, a Rolex calibre 4130 movement, and a coveted Cerachrom bezel with a new-style Tachymeter scale. This watch commands a much higher price on the secondary market due to high demand and short supply and is the grail watch of many. The Oystersteel and platinum variation of the Yacht-Master ref. 116622 turned heads when it debuted at Basel World 2016, offering a satin and polished stainless steel finish, a dark rhodium sunburst dial, and subtle blue accents via a light blue seconds hand and Yacht-Master logo. This slight contrast on the dial seems to complement the Rolesium finish and grey dial perfectly, creating a watch that stands out without being too in-your-face. Of course, the case also boasts the regatta watch’s signature tapered lugs for a slightly more elevated style on the wrist. Just this year, Rolex released a new variation of the two-tone Pepsi bezel and Jubilee bracelet GMT Master II in steel via reference 126710. For years, collectors have been patiently waiting for a new Pepsi GMT, and this year Rolex delivered. What makes this particular reference so popular among collectors is that the red and blue Pepsi bezel is now in Cerachrom, the case is only available on a Jubilee bracelet thanks to a new case design, and a new calibre 3285 with a 70-hour power reserve and a Paramagnetic blue Parachrom hairspring beats within the case. The Rolex Explorer is widely sought-after by collectors for both its sophisticated style and its interesting history. The Explorer debuted shortly after Tenzing Norgay and Sir Edmund Hillary reached the peak of Mount Everest, offering a movement, case, and bracelet that were prepared to tough virtually any terrain. The newer model ref. 214270 came to market several decades later in 2016, offering a few notable upgrades such as longer hands to better accommodate the larger 39mm case that was introduced previously, more visible lume on the dial, and an impressive calibre 3132 perpetual movement. Tweaked to perfection, it comes as no surprise that the newest Explorer tops the list of many collectors. Many collectors took the Sea-Dweller ref. 116600 for granted while it was still in production, assuming that it would be a while before Rolex replaced it. To the surprise of many, Rolex released the newest variation of their deep saturation diver via ref. 126600 just three years later with a larger 43mm case, the reappearance of the Cyclops magnifier on the crystal, and red script on the dial. While the new variation is certainly impressive and also brings with it a brand new calibre 3235 movement, many collectors prefer the smaller 40mm case and the absence of the Cyclops on the crystal, which makes the discontinued ref. 116600 highly sought-after on the secondary market and worthy of our list. Ryan Sprance is the Founder and Chief Strategist of Kaihatsu Media, a Digital Marketing agency focused on developing brand awareness and sales growth through social media, optimizing digital marketing spend and developing Influencer Marketing programs. He is also the Creator & Editor-In-Chief of TheStylishMan.com, a men's lifestyle media company focused on Fashion, Fitness, Grooming, Gadgets and Guy Stuff and a Contributing Editor at Julius, a data driven Influencer Marketing platform. Sucess! You will love our updates. © TheStylishMan.com is a wholly owned subsidiary of Kaihatsu Media, LLC.